Belgian Prime Minister Charles Michel and U.S. Vice President Mike Pence give a statement in Brussels, Belgium, Feb. 19, 2017. U.S. Vice President Mike Pence says he is looking "very much forward" to his talks Monday with European Union and NATO leaders. Pence is on his first trip to Europe since taking office, intending to reassure allies the United States remains a staunch friend amid concerns about the new administration's "America First" strategy. The vice president's schedule includes meetings with EU foreign policy chief Federica Mogherini, EU Council President Donald Tusk and EU Commission President Jean-Claude Juncker. Mogherini said after meeting U.S. officials in Washington last week that maintaining multilateral sanctions on Russia, keeping the Iran nuclear agreement in place and addressing the refugee crisis are issues the EU would like to collaborate on with the U.S. EU officials will also likely seek clarity on Trump's prediction last month in two European newspaper interviews that other countries would follow Britain and leave the alliance. In the afternoon, Pence meets with NATO Secretary General Jens Stoltenberg to close his European trip. He expressed support for NATO at the alliance's security conference Saturday in Munich, adding reassurances after Trump's campaign statements describing NATO as "obsolete." Germany Security ConferenceU.S. 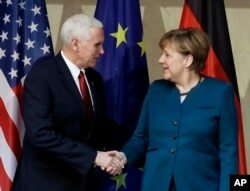 Vice President Mike Pence, left, and German Chancellor Angela Merkel meet for bilateral talks on the sidelines of the Munich Security Conference in Munich, Germany, Feb. 18, 2017. "The United States of America strongly supports NATO and will be unwavering in our commitment to our transatlantic alliance," Pence said in his first major foreign policy address for the new administration. 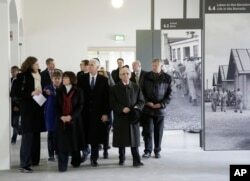 Pence, his wife, Karen, and daughter Charlotte visited the Dachau concentration camp memorial early Sunday. The camp was established by the Nazi government in 1933 near Munich. The Pence family paid tribute to the International Memorial at the center of camp, placing a wreath. They also visited a Jewish memorial and a Catholic memorial on the grounds, toured the barracks, a crematorium, and a gas chamber. Pence acknowledged his extremely busy schedule during a surprise meeting in Munich Saturday with rock band U2 frontman Bono. After Pence thanked Bono for "the chance to get together," Bono said, "You're the second busiest man on earth, so we really do appreciate it," as onlookers laughed.